My true passion in life is Ultimate Frisbee. I discovered the sport in 2009 when a friend asked me to go play. I was hesitant, but I went out there to see what it was. I instantly fell in love with the sport. I bought new cleats, joined a recreational league and threw some very wobbly discs. In the fall of 2010 I attended Kansas State University where I was ecstatic to be a part of their women’s ultimate team, Cheshire. My love for ultimate only grew stronger – running and throwing frisbees is only part of it, the other part is the amazing new friends you make. As I practiced and trained, I improved and grew. I became president and captain of K-State Cheshire and focused on getting more women interested in the sport. Since graduating from K-State in the spring of 2014, I have played competitively, captained, and even coached. Most importantly, I founded a Kansas City based women’s ultimate team called Wicked Ultimate. This year, 2018, is our fifth season. I am so proud of how far we have come, both skill and exposure. We have had hundreds come out for our team. We continue to compete at a more elite level each year. At the end of the 2017 season with Wicked, I felt a sharp pain in my knee. I couldn’t continue to play, run, or even jog. Even before I knew I needed surgery I decided to visit Athletico. I wanted as much information and as many options as possible. My physical therapist, Andy, kept me cheerful and positive through all of the uncertainty. 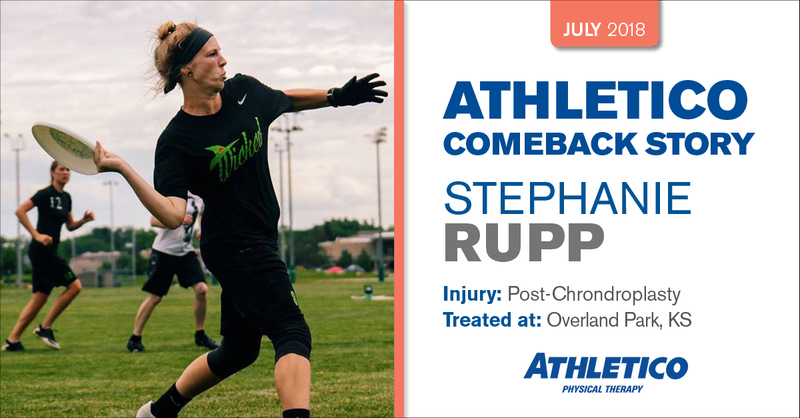 After having knee cartilage repair surgery (chrondroplasty) in December, I returned back to Athletico right away to start healing. Even when I was still on crutches Andy had skills and movements for me to practice. Athletico has helped get back to what I love doing. Each week at Athletico I made mountains of progress. I’ve not only gotten stronger, but I’ve learned smarter and safer ways to warmup and stay in shape. A goal of mine that I spoke to Andy about was to be able to play in the Kansas City Ultimate Showcase – a large, city-wide event showcasing professional ultimate, men’s and women’s, to a new audience. As March rolled around, I began to jog and run. I was able to practice with the professional women’s team and then ultimately (pun intended) play with them in front of a crowd at the showcase weekend. It is one of my favorite moments playing ultimate.